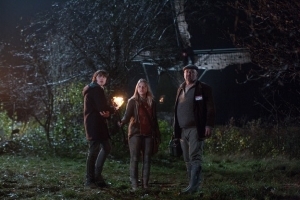 Dutch Horror THE WINDMILL Coming this October! Best known for his work as producer on the excellent Frankenstein's Army (review) and Dead End, Nick Jongerius is trying his hand at another aspect of filmmaking: directing. It was announced earlier today that Jongerius' debut feature, a horror movie titled The Windmill, has been picked up for North American release by XLrator Media which will release the project on their Macabre label. The Windmill stars Noah Taylor ("Game of Thrones," "Peaky Blinders"), Charlotte Beaumont, Patrick Baladi, Tanroh Ishida and Ben Batt as tourists who find themselves stranded in the Dutch countryside when their tour bus break down. It is a horror movie so as you might expect, things get ugly when they take shelter near a windmill which is said to have been the home of a "a Devil-worshipping miller once ground the bones of locals instead of grain." The Windmill will have its world premiere at FrightFest next month and be followed by a release in October â€“ just in time for Halloween. "It's hard to run for your life in wooden shoes!"